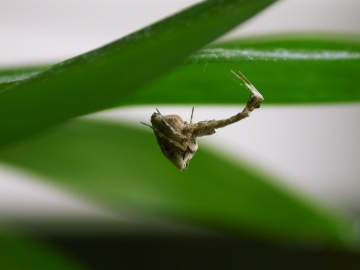 The ‘Garden Centre’ spider is a species that has rapidly colonised Britain over the last 20 years, probably transported on plants from growers in The Netherlands. It is most common in the sales areas of garden centres where there is constant warmth. 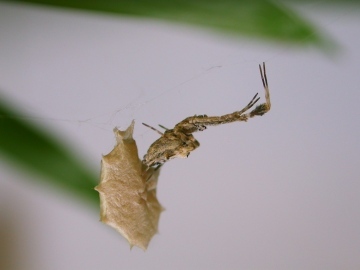 The species spins an orb-web similar to that of the common Garden spider but it differs in two respects: (a) it is usually more horizontal and (b) there is sometimes, but not always, a band of whiter silk running through it (a stabilimentum). The spider itself is small (body length of females about 5-7 mm) and resembles a minute twig suspended in the web. It is very variable in colour and rests in a characteristic position with its first pair of legs stretched forwards and usually folded half-way down. The cephalothorax seems to attach to the abdomen at right angles, making a T-shape. The first pair of legs each has a distinct section of black hairs. The egg sac may be more visible that the spider itself and is often attached to surfaces near the web. It varies from dirty white to brown, and is around 10 mm long and flattened. In outline it is shaped like a holly leaf, with projections around its edge (see photograph below).